Along with our technology platform provider, we developed an easy-to-use, child- and family-friendly system that has achieved positive results in patient satisfaction, communication, healthcare utilization, quality, and safety measures. When children need specialized hospital care, education and communication are important to make sure children and their parents and family members understand what’s going on every step of the way. However, patient education in a pediatric setting is challenging. There are different ages, education levels, and diagnoses to take into account. 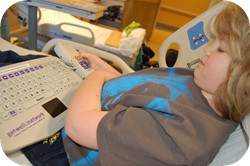 PSE&G Children’s Specialized Hospital is unique in using an innovative technology platform to engage, educate, and communicate with its young patients and their family members. It’s an Interactive Patient Care (IPC) platform and practice that is improving satisfaction levels and other patient outcomes, and has just been featured in the March-April 2016 issue of Pediatric Nursing, a respected professional journal. Children’s Specialized Hospital, the largest pediatric rehabilitation hospital system in the United States, partnered with the GetWellNetwork™ to create a customized patient experience with condition-specific educational content and engaging entertainment options delivered through in-room televisions. Called GetWellTown, it includes personalized information about the patient’s care plan, pediatric health and safety videos in English and Spanish, staff profiles, hospital visiting hours and events, and dining options, along with access to family-friendly movies, internet, games, music, email, and instant messaging. Parents receive a guide to hospital policies and services and controls to block portions of content, while staff members can order clinical education at the right time, escalate non-clinical issues, and launch IPC Pathways, a guide that helps patients and family members through the care process. The system starts at admission and follows each patient through discharge, including surveys to gauge home and school readiness and overall patient and family satisfaction, which are important indicators of successful at-home care and rehabilitation and are also followed closely by The Joint Commission, a nonprofit organization that monitors and accredits healthcare institutions in the United States. “We’ve seen significant increases in satisfaction scores, and we believe that is due in part to the way we’ve pioneered and championed our interactive patient care platform,” said Provenzano. From 2013 to the first quarter of 2015, Children’s Specialized Hospital discharge patient satisfaction scores increased from 69.8 to 78.6 percent, doctor communication scores rose from 66.7 to 85.7 percent, and the score that indicates that patients and family members felt informed increased from 67.7 to 81.5 percent. Due to this success, other IPC projects and components have been implemented already at Children’s Specialized Hospital, and the health system is taking steps to deliver the same kind of education after discharge through myGetWellTown, which will allow patients and their families to interact with their personalized care plans, receive tools to manage chronic conditions, and input progress updates post-discharge whether at home or on-the-go.